Dr. Lynn R. Cominsky, Professor and Chair of the Department of Physics and Astronomy, joined the faculty at Sonoma State University in 1986 and became chair of the Physics and Astronomy Department in 2004. She also founded Sonoma State’s Education and Public Outreach group in 1999. Previously, she worked with the University of California, Berkeley Space Sciences Laboratory and NASA’s Extreme Ultraviolet Explorer Satellite Project. Dr. Cominsky earned her PhD from the Massachusetts Institute of Technology and her BA from Brandeis University. The 2015 Rossi Prize has been awarded to Fiona Harrison, the Benjamin M. Rosen Professor of Physics at Caltech, for her "groundbreaking work on supernova remnants, neutron stars, and black holes enabled by NuSTAR." The award is the top prize in high-energy astrophysics. NASA's Nuclear Spectroscopic Telescope Array, or NuSTAR, has captured the best high-energy X-ray view yet of a portion of our nearest large, neighboring galaxy, Andromeda. The space mission has observed 40 "X-ray binaries" -- intense sources of X-rays comprised of a black hole or neutron star that feeds off a stellar companion. NASA has announced the second opportunity for scientists around the world to propose for observations of celestial sources using the NuSTAR X-ray space telescope. This Guest Observer (GO) Program is part of an extended mission plan approved by NASA that offers observing time for basic research investigations selected in a competitive process. 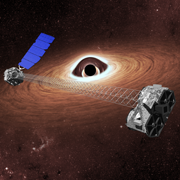 Proposals for observations to be made within the second cycle of the NuSTAR GO program are due on December 11th, 2015. When I stop and think about it, it never ceases to amaze me that radio waves, infrared light, which we experience as heat, x-rays and gamma-rays are all the same fundamental physical phenomenon – light, or electromagnetic radiation. The thing that distinguishes these different kinds of light is the wavelength. X-rays light up the surface of our sun in a bouquet of colors in this new image containing data from NASA's Nuclear Spectroscopic Telescope Array, or NuSTAR. Some of the "biggest and baddest" black holes around are buried under thick blankets of gas and dust. These monsters in the middle of galaxies are actively devouring material, but their hidden nature makes observing them a challenge. NASA's Nuclear Spectroscopic Telescope Array (NuSTAR) recently caught a glimpse of five of these secluded beasts. NASA's Nuclear Spectroscopic Telescope Array, or NuSTAR, has found evidence that a massive star exploded in a lopsided fashion, sending ejected material flying in one direction and the core of the star in the other. The sun's surface is blisteringly hot at 10,340 degrees Fahrenheit -- but its atmosphere is another 300 times hotter. This has led to an enduring mystery for those who study the sun: What heats the atmosphere to such extreme temperatures? Normally when you move away from a hot source the environment gets cooler, but some mechanism is clearly at work in the solar atmosphere, the corona, to bring the temperatures up so high. Peering into the heart of the Milky Way galaxy, NASA's Nuclear Spectroscopic Telescope Array has spotted a mysterious glow of high-energy X-rays that, according to scientists, could be the "howls" of dead stars as they feed on stellar companions. NASA's Nuclear Spectroscopic Telescope Array and ESA’s XMM-Newton telescope are showing that fierce winds from a supermassive black hole blow outward in all directions -- a phenomenon that had been suspected, but difficult to prove until now. The 2015 Rossi Prize has been awarded to Fiona Harrison, a professor at the California Institute of Technology in Pasadena, California, for her "groundbreaking work on supernova remnants, neutron stars and black holes enabled by NuSTAR". For the first time, a mission designed to set its eyes on black holes and other objects far from our solar system has turned its gaze back closer to home, capturing images of our sun. NASA's Nuclear Spectroscopic Telescope Array has taken its first picture of the sun, producing the most sensitive solar portrait ever taken in high-energy X-rays. The giant black hole at the center of the Milky Way may be producing mysterious particles called neutrinos. If confirmed, this would be the first time that scientists have traced neutrinos back to a black hole. The evidence for this came from three NASA satellites that observe in X-ray light: the Chandra X-ray Observatory, the Swift gamma-ray mission, and the Nuclear Spectroscopic Telescope Array. NuSTAR featured in Discovery Channel documentary called 'The Science of Interstellar'. Matthew McConaughey narrates this behind-the-scenes look at the epic voyage to deep space depicted in the movie Interstellar. Director Christopher Nolan worked with top physicists to create a realistic trip to distant solar systems. NASA will host a news teleconference at 10 a.m. PDT (1 p.m. EDT) Wednesday, Oct. 8, to announce new findings from its Nuclear Spectroscopic Telescope Array (NuSTAR) mission. The results describe an unusual source of X-rays that will leave theorists scratching their heads, but also will help astronomers learn more about how black holes and galaxies are formed. When the most massive stars explode as supernovas, they don't fade into the night, but sometimes glow ferociously with high-energy gamma rays. What powers these energetic stellar remains? Peering into supermassive black holes and picking through the remains of exploded stars is among the detective work the NuSTAR telescope performs. Launched in June 2012, the comparatively small telescope uses high energy x-rays to penetrate dust and gas to get a clear look at some of the densest, hottest regions of the universe, says Fiona Harrison. Announcement of opportunity to propose for NuSTAR observations - cycle 1. NASA's Nuclear Spectroscopic Telescope Array (NuSTAR) has captured an extreme and rare event in the regions immediately surrounding a supermassive black hole. A compact source of X-rays that sits near the black hole, called the corona, has moved closer to the black hole over a period of just days. Special sessions on NuSTAR highlighted the results from the baseline mission.